This pickled cauliflower and potato salad recipe was devised from the suggestions in our final 4-ingredient challenge - miso, cauliflower, potato and iceberg lettuce. On occasion we like to challenge ourselves. We ask our visitors to suggest four of their favorite food ingredients and then we create a unique recipe from the four ingredients. We can add to the ingredients but we must use all four in the same recipe preparation. It's a fun way to spark some creative thinking! This was just such a recipe. The bigger challenge for this one turned out to be finding miso in the area in which I live! But, the natural foods store came through. So we decided to skip the "almost a given" miso soup and try something different...using all the suggested ingredients and adding a few more to create this delightful cold salad. Grilling lettuce is always a challenge. 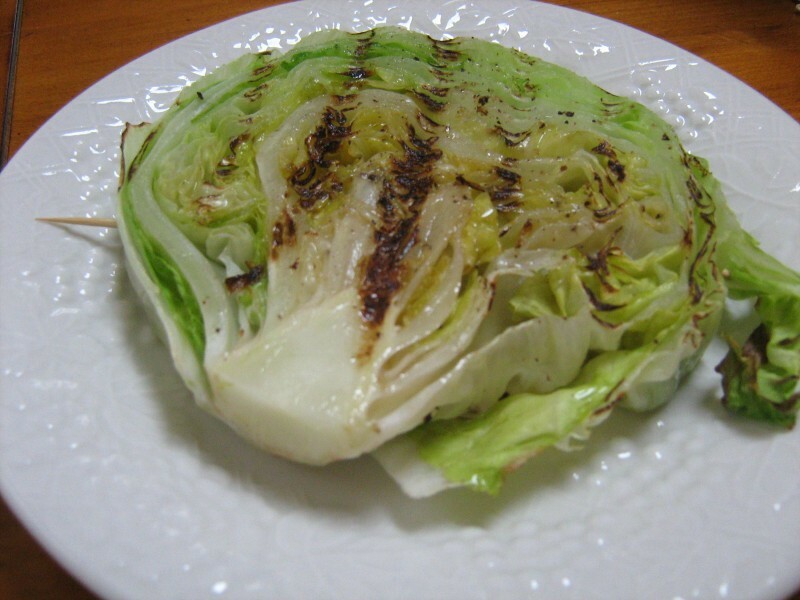 If you haven't tried grilled lettuce you will love it. It really does bring a whole new flavor to a salad. But, as I said, it can be a challenge in itself. I usually use romaine hearts but in this case chose iceberg lettuce. It grills fairly well as long as you cut it correctly. However, it should also be noted that the pickled cauliflower and potato salad recipe takes awhile to prepare and should be served only after sitting as stated in the recipe. as the pickeling process softens it to a light crunch. Add in the potatoes, cut in quarters. Add in the dill weed and reserved miso mixture. day, when the cauliflower is ready. Remove the cauliflower and potato salad from the refrigerator. to mix thoroughly. Place back in the refrigerator to keep chilled. by cutting it in half, down through the stem and heart of the head. thick)slices of the lettuce. Try to keep it intact as much as possible. use one in each side of the lettuce slice to help hold it intact. bottom of the half if using the half without slicing). 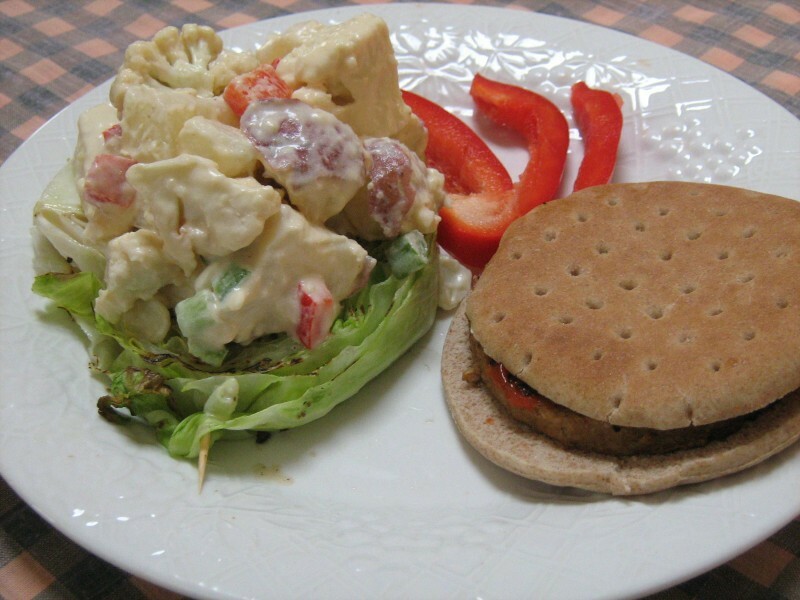 lettuce slice with a "pile" of the potato salad. Serve with your favorite veggie burger.